Our OpenMenu Creator just got easier with the latest release. 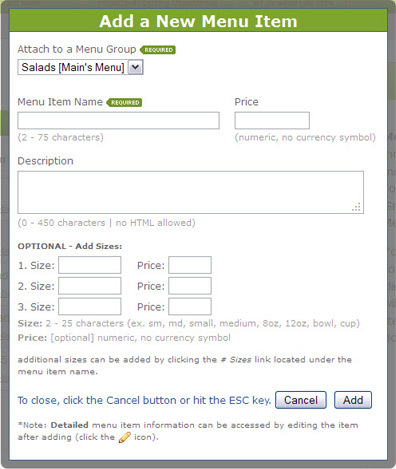 This release adds a new Quick Add dialog system that will make adding items to your menu much, much easier. Not only did we add a new dialog based system but we added Quick Select Lists for quickly entering information that may be repetitive on your menu (like Item Sizes and Tags). This release focused on speed of getting a menu converted to an OpenMenu. Have something you would like to see to make your life easier when managing your OpenMenu? Let us know. What about the ability to build “combination” menu items, that are a packaged combination of other menu items, usually with a discounted price? 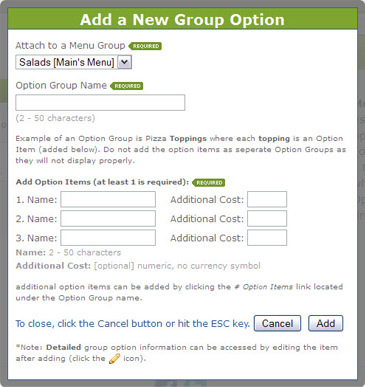 This would save much repetition when common, complex menu items are included in discounted deals or packages. This is something we will look into and consider. At our restaraunt, we have different kinds of dishes, like Chicken or Shrimp Chow Fun. It’d be nice to represent the different prices for these items under an item itself rather than creating new menu items for each kind. All you would need to do is create the default item (Chow Fun) and then use Item Options for each kind and price (Chicken and Shrimp).